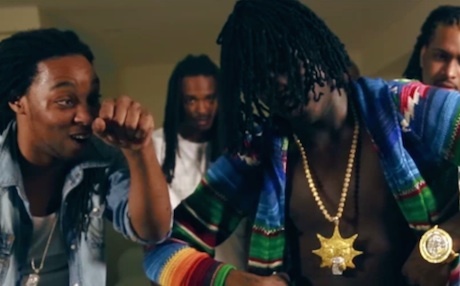 No word yet on when Bang 3 will arrive, but Chief Keef has delivered another video to the internet with "Gucci Gang," a new song and video. The track, which sees Keef sharing the spotlight with Justo and Tadoe, is seriously bizarre, with the bouncy bass and multiple synths flowing in and out of clarity. It's truly weird, but only serves to support the idea that Keef's an innovator in his own lane. The video's a little more straightforward, with Keef and his pals moshing up a storm in a suburban basement. That said, the normal look of the video only adds to the strangeness the experience. Check out "Gucci Gang" below.